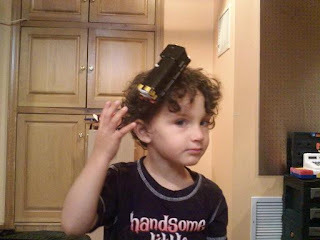 This morning, in a moment of sheer brilliance, my younger son, Jamie, decided to ‘wear’ his electric toy train by turning it on and then placing it on his head. Needless to say, it took about fifteen minutes before I could disengage the locomotive’s wheels from my son’s springy locks. At the time, I was so exasperated with both of my sons that I nearly let Jamie wear his new hat for a while. But then I remembered how, as a five-year-old, I came up with the ingenius idea of creating a Spider-Man mask by taking some Wrigley’s gum, sticking it atop my hair and then pulling the sticky strands down so to make a gummy web around my head. This was just after my mother had spent an inordinate amount of time blow drying my hair. So, in the great scheme of things, I think Spider-Man beats out Mavis any ole day of the week. As anyone who has kids probably knows, being a parent can be a truly exhausting experience. The day-in-day-out experience of making sure the kids are properly fed, dressed, behaved, taught important lessons, loved and protected can really wear one down. The amount of gray hairs on my head are certainly a testament to this. But then I remind myself that someday these kids are going to grow up, have their own lives and not need as much attention and I know I’m going to look back on moments like these with a deep fondness. So, thanks for wearing the train hat, Jamie and when your own child comes up with a unique hat to wear, I hope you get as much of a chuckle with it as I did with you today. ← Aidan Quinn Joins the Evolution!